Sometimes dyeing is like working in a lab . 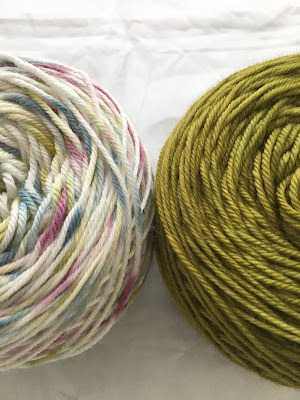 . . testing yarn bases, trying new colors and techniques. I have a little experiment going on right now. I dyed a new DK weight base that I wanted to sample. 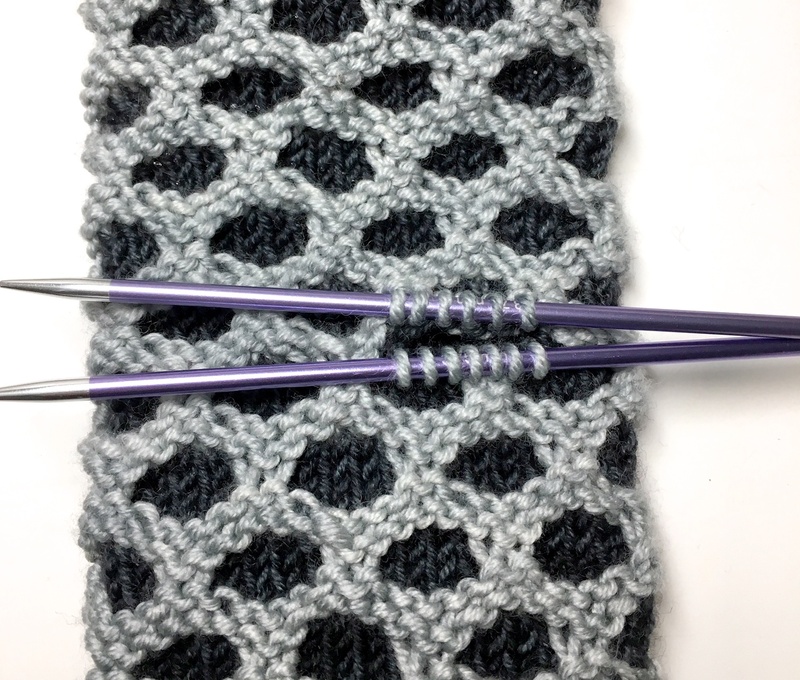 I paired it with a pattern I had on my list. 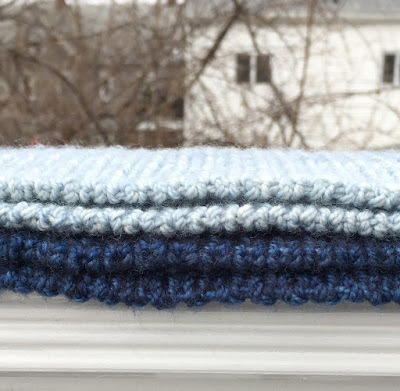 Simple stripes and stockinette stitch . . . so far I like it. 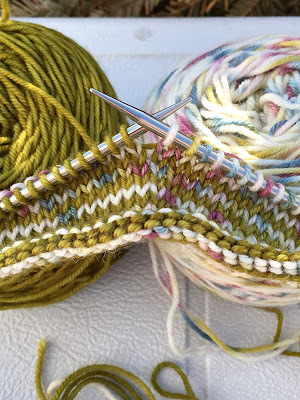 Sometimes I need a day of relaxing yet productive knitting, and yesterday was one of those days. I have a pompom stash to choose from, so I started there. 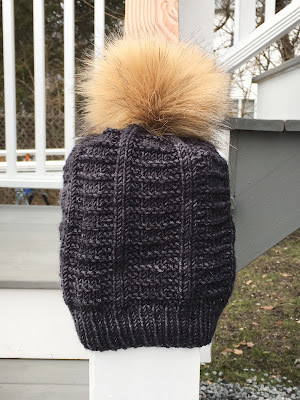 I picked the pompom I wanted to use and worked my way down to the yarn and pattern. In no time at all, I had a hat up and running. I had an unscheduled day, so I worked on it here and there. I took time out to get groceries, made dinner for the family, did laundry and dirty dishes . . . all surrounded by knitting. By the end of the day, I was finished. One Beer by Thea Colman. 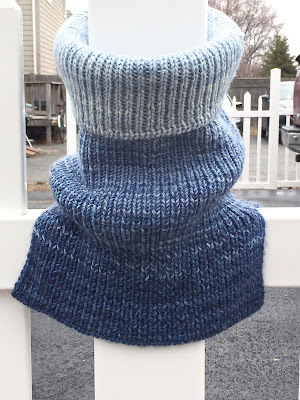 I was looking for a relaxing knit, and this design fits the bill with an easy to memorize garter and rib stitch pattern. 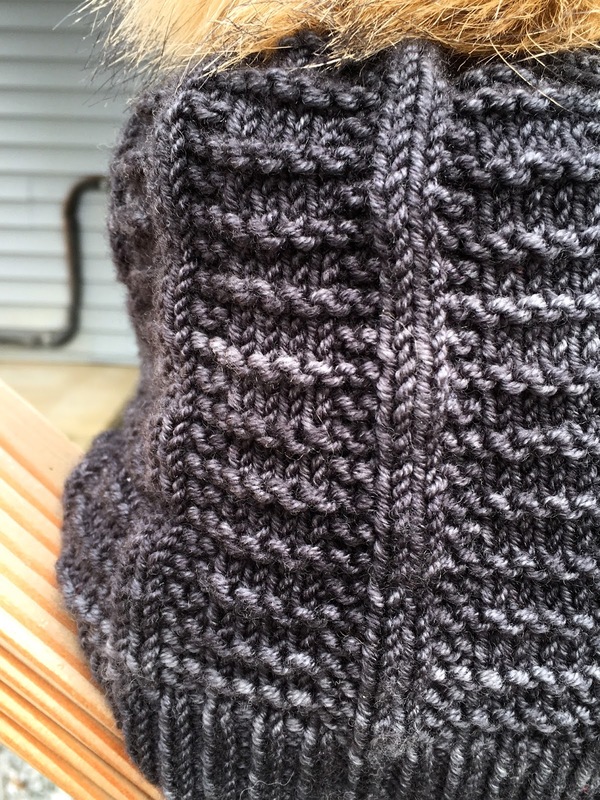 The yarn is Norma, colorway Raven. Sad to say I still haven't listed this yarn on the website. 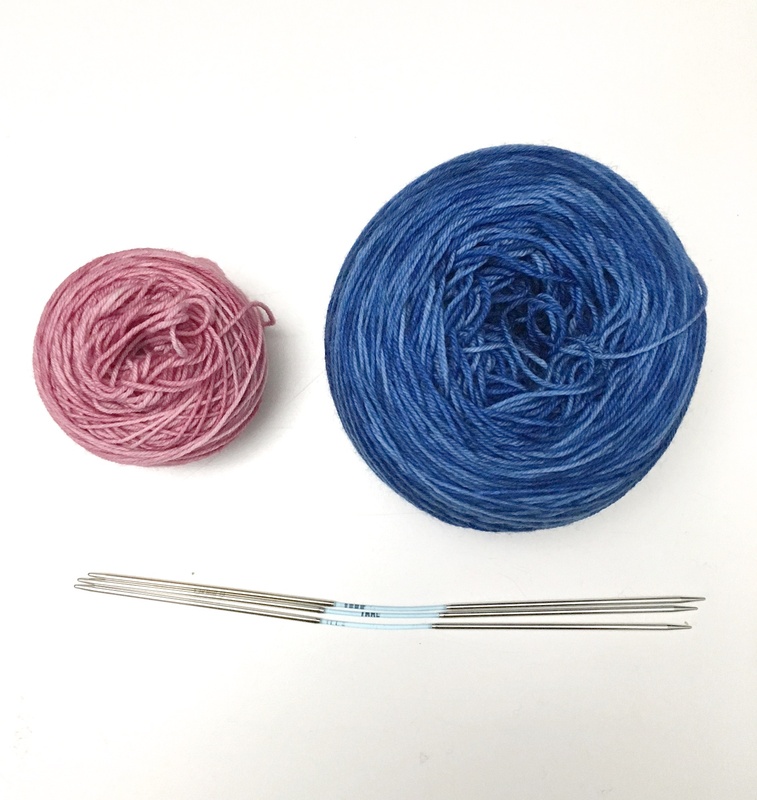 If you're intent on getting it, KnitWit and Romney Ridge Yarns & Wool have it in stock. If that's not convenient, contact me. Only one beer was consumed in making this hat. 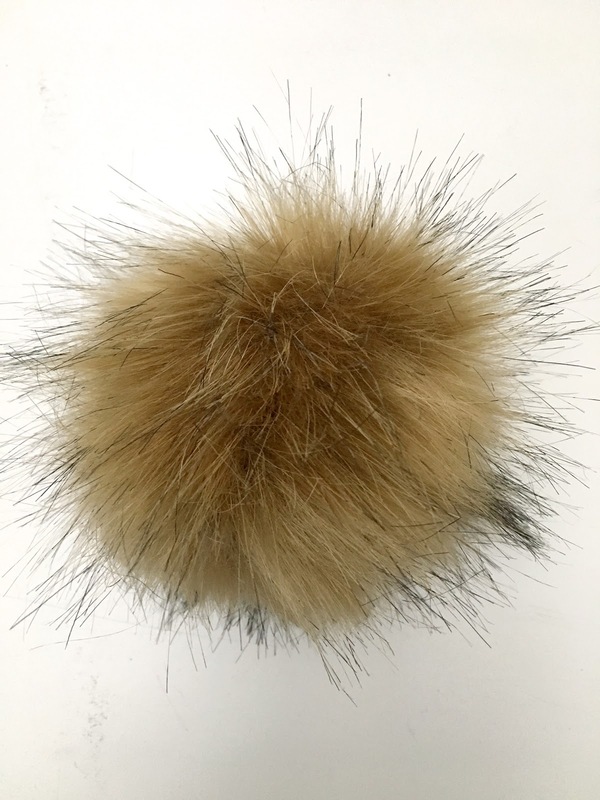 I attached the pompom with the button method. If you're interested in the details, I posted a little how-to here. 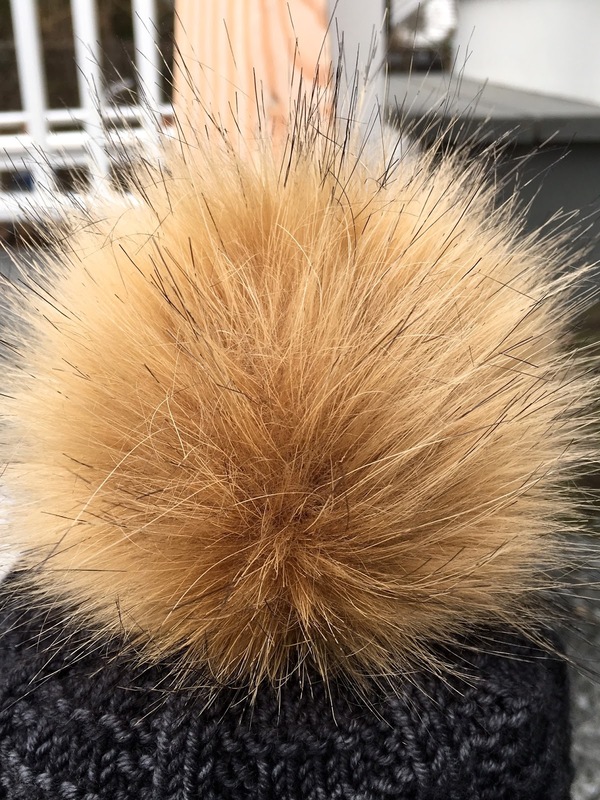 A black-tipped pompom for the finishing touch. 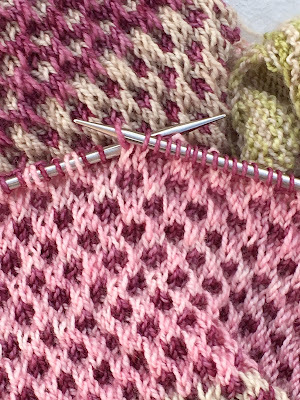 Some days I want to declare a knitting day. Nothing but knitting all day long. 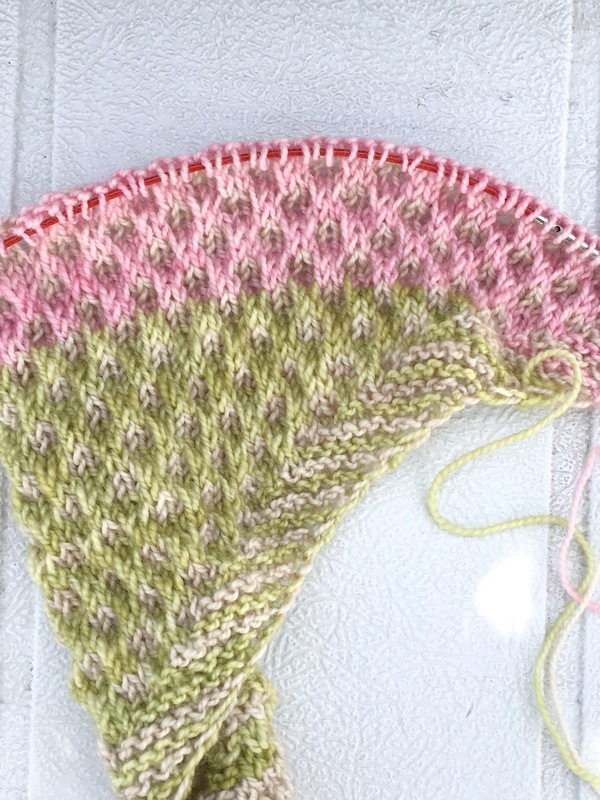 Things are getting interesting with Your Slip is Showing, and this morning I wanted a knitting day. And I would have settled in with needles and yarn except . 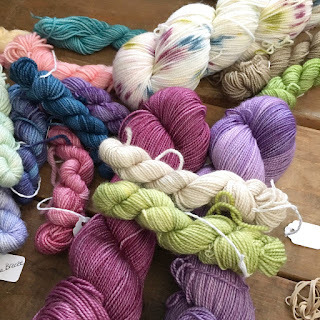 . . tomorrow is Farm Fiber Day at the Wayland Winter Farmers' Market. Instead of knitting, I need to pack up and load the truck. This is a busy, action-packed event. Great food, lovely people, fun all around. This is the last fiber day for this winter market. If you're in the area, check it out. 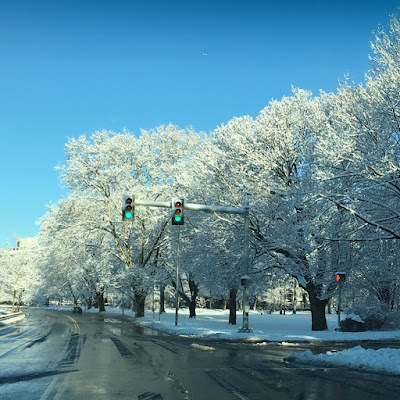 Winter is my favorite season, and fresh snow a few days ago provided this week's color inspiration. 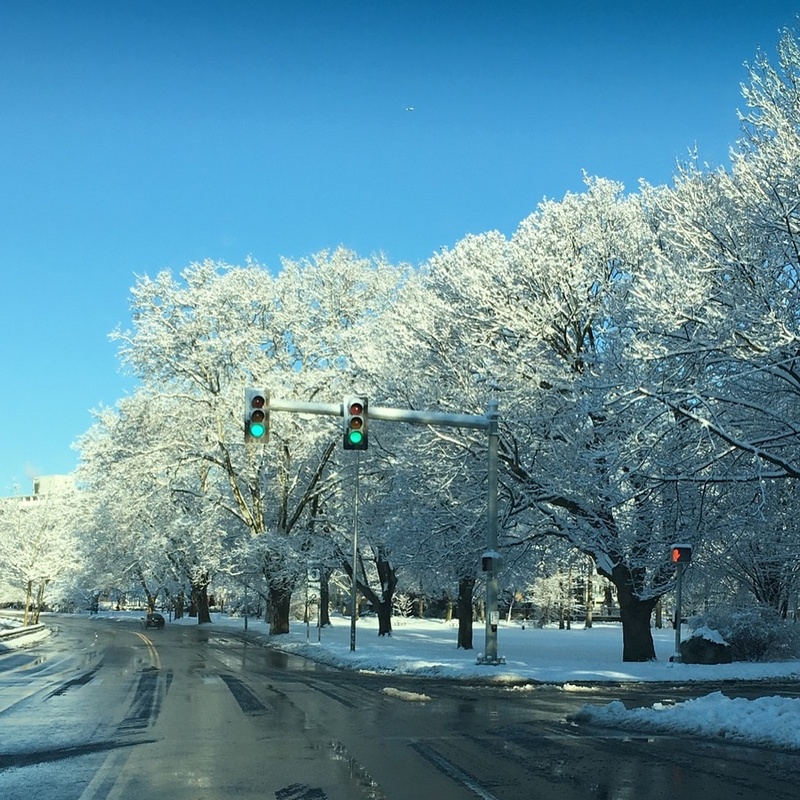 White, blue . . . brilliant. Flying Solo is off the needles, and I'm thrilled with it. This cowl is like a hug for your neck . . . soft, squishy and cozy. It's long enough so you can also pull it up and cover your face when the snow is blowing and drifting. This design features splits at the shoulders for easy wear. Slipped stitches create nice, clean edges. 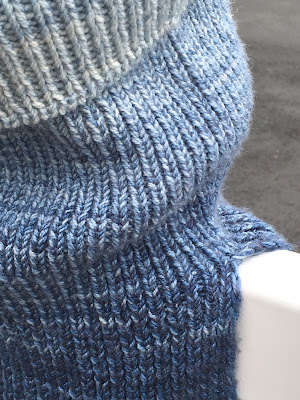 Speaking of edges, there's nothing like a tubular cast on and bind off to make things neat and tidy. The pattern calls for a tubular bind off, so I went ahead and did the same for the cast on. I used a Lillian Gradient Bundle. This colorway is Drizzle. 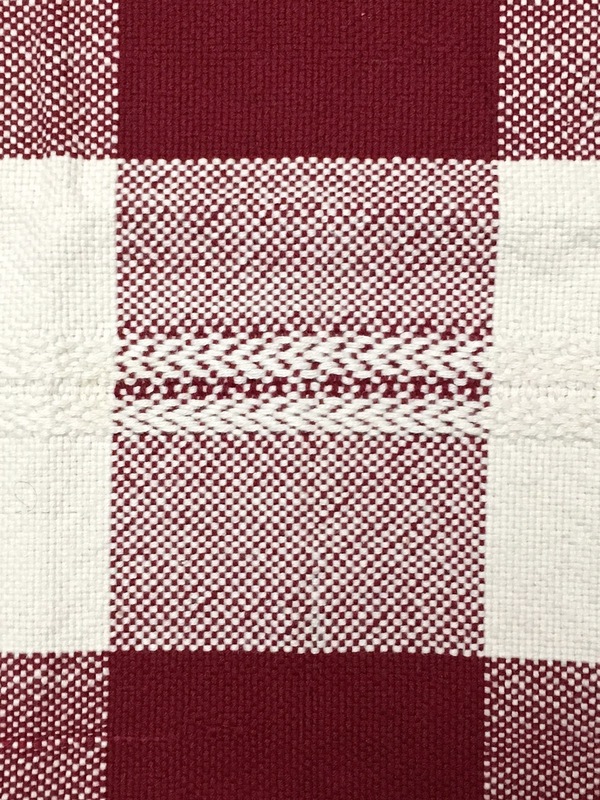 The pattern calls for three colors, but the bundles have five. I reconfigured the rounds to include all five colors. 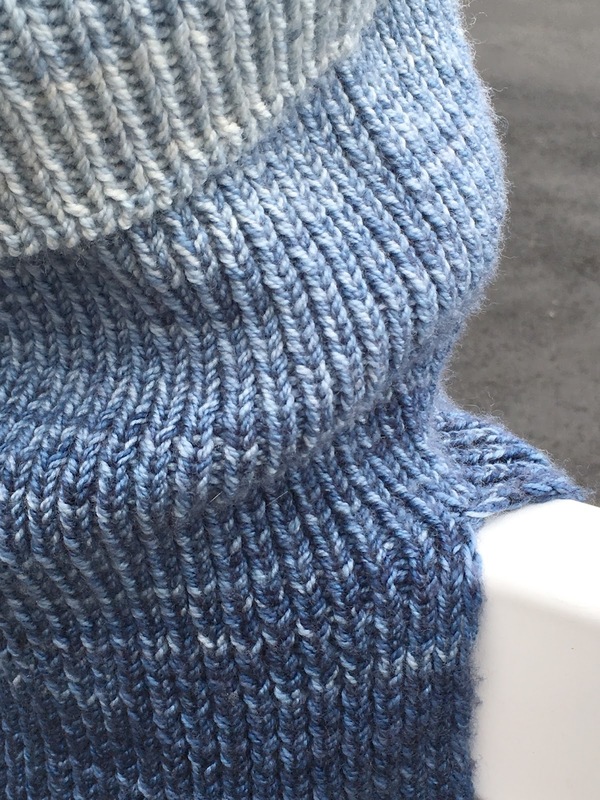 This is a relaxing knit but not completely mindless. And now I'm envisioning it in other colors. I admit that picking colors for a project can be challenging, especially when more than two are involved. 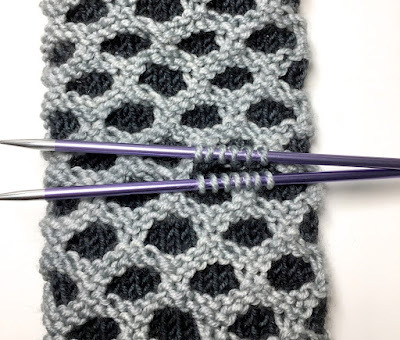 I got a preview of my current project before the pattern was released. It requires four colors, so I took a couple days and went back and forth on different options. I changed my mind several times, and the final combination wasn't remotely close to what I started with. I downloaded Your Slip is Showing when it was released last week. The cool thing about this pattern is that it includes a color schematic, so you can map out your selections before you start knitting. 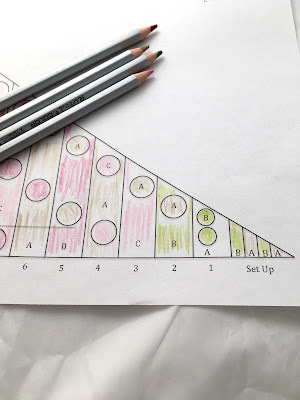 I had already settled on my colors, but I pulled out my colored pencils and filled out the schematic anyway. I could always go back to the drawing board if I didn't like the way the colors looked on paper, but I was satisfied with the result. The schematic is a clever addition to the pattern. Kudos to Bronwyn for including it. 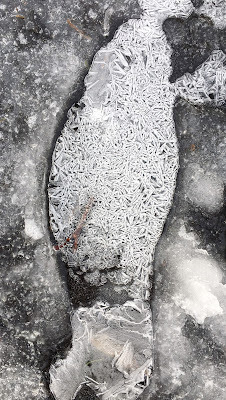 The Olympics are on, and I've been mesmerized by the ice. 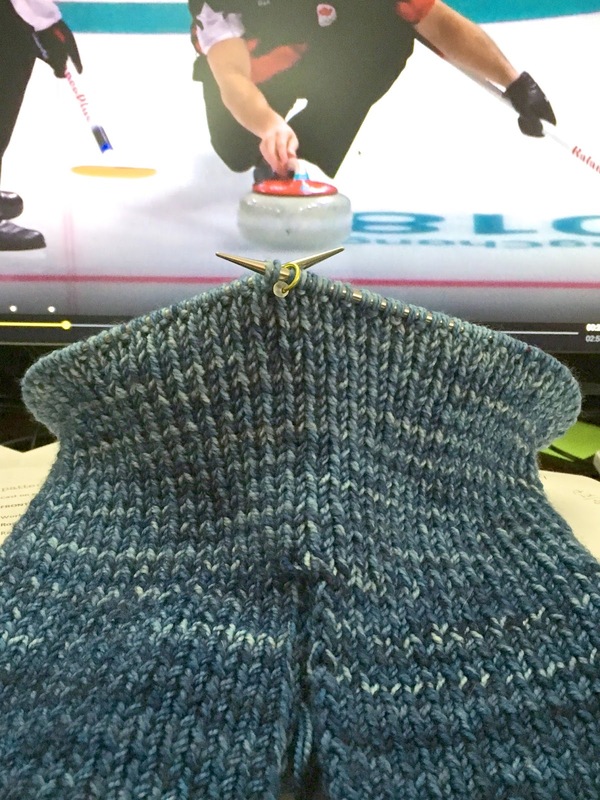 Curling and hockey are two of my favorites, and I've spent hours watching and knitting. This is my Flying Solo adapted for a gradient bundle, and it's moving along quickly. There are more hours of curling and hockey on the schedule. I'm prepared. I have another project waiting patiently in the wings. This week's color inspiration is full of texture and contrast. 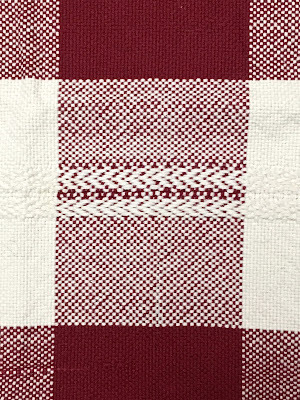 This is just a snippet of a towel from Boston Wool Works. Siobhan is very clever at making things from recycled fibers. Follow the link for more information. I've cleared the decks and emptied my needles. I've given myself permission to cast on something new. If you finish two or three projects, it opens up a whole world of possibilities. I have several new projects patiently waiting and decided to tackle this one first. I'm using a gradient bundle and had to make some adjustments that involved a fair amount of math and plain old counting. So far, so good. 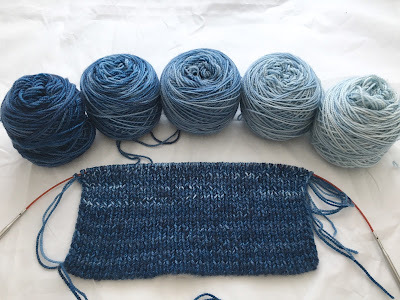 At this point I'm confident my numbers will work, but I want to knit another section just to make sure. Pro tip: always reserve the right to rip out and start over. Since this project seems to be running smoothly, I think I'll cast on another one. But first I have to pick the colors. Recently I went on a pompom bender, and now I'm immersed in all sorts of ideas. I have a list of hat patterns a mile long so that's not a problem, but I got to thinking about washing said hats. What about the poms? I had visions of wet, bedraggled, furry blobs. What if one day I decided I'd like the hat without a pom? Or what if I wanted a different pom on the hat? Clearly the only solution was to make the pompom detachable. I did a fair amount of research and settled on this method. This is my Newfie Hat along with a pompom and a button. 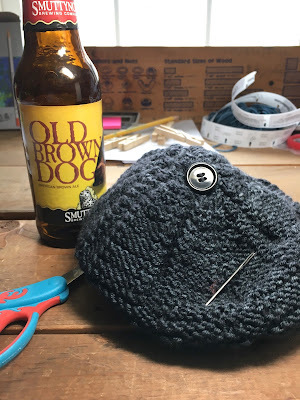 Start by sewing the button to the top of the hat on the inside. This pompom came with two strings. I also have some with loops. Either one will work. If you don't have strings or a loop, wrap a piece of yarn around the middle of the pom and create two ends. Thread the ends through a needle. Pull the strings to the inside at the top of the hat. 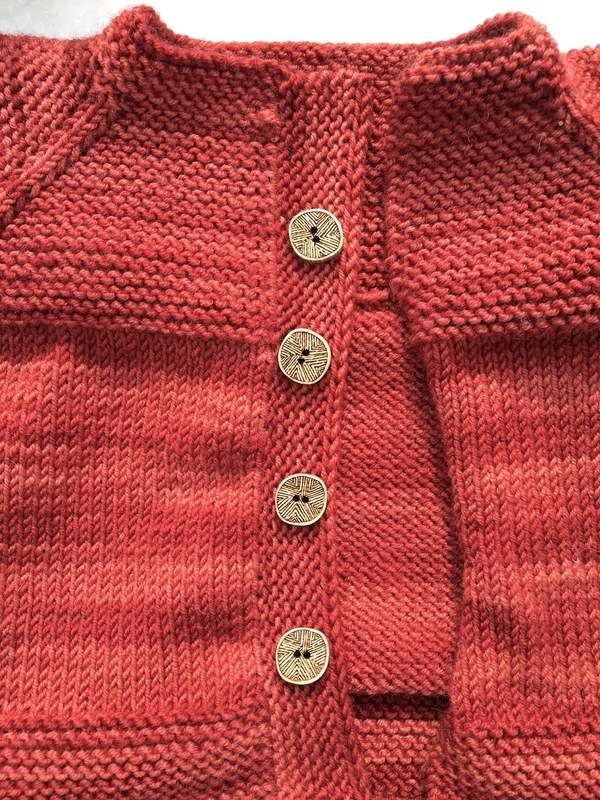 If you have a loop, pull it through the top with a crochet hook. Wrap the strings around the button several times. I crisscrossed mine. Then tie tightly in a bow. If you have a loop instead, wrap it around the button. This pom is securely attached and can easily be removed. Pompom perfection. Most days my life is a juggling act, but this morning a couple balls went bouncing. From the broken disposal to the backed up sink to the piles of dirty dishes . . . it all came to a head. Somehow today doesn't seem like Friday, but when I realized I'm cooking for a family gathering this weekend, I got serious and found someone to fix the disposal. And since today is Friday that means I forgot to place a yarn order yesterday. Another ball I dropped. For the moment crisis has been averted. Yarn is on the way, and I have a couple guys in the kitchen up to their elbows in murky water. While they bailed water and disassembled the disposal, I made forward progress on another front. One band done, one more to go. I tried these buttons, and I like the look. They're keepers. It's been an icy week here - treacherous and enchanting at the same time. This week's color inspiration is black and white. 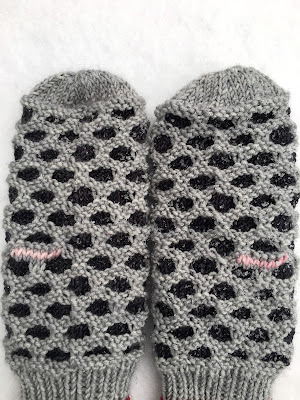 I've been focused on a pair of Newfoundland Mitts, and now all they need is thumbs. 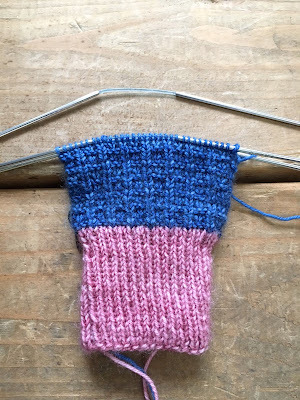 I unraveled the pink yarn to expose the thumb stitches. Just a few short rounds and these mitts will be finished. The other day I took a little break from my current projects to get this up and running. 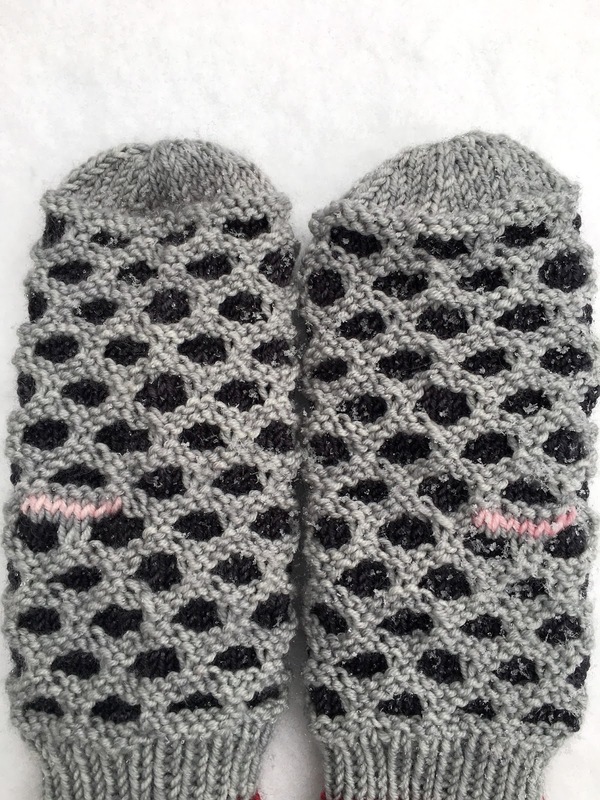 This is the Yarn Knot Socks installment for last month, and I've been eager to give these Addi FlexiFlips a try. I had a couple false starts but finally got things sorted out. 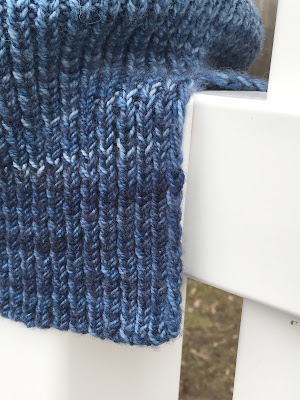 This year Yarn Knot Socks includes a mini skein with each installment, and I decided to use mine on the cuffs and toes. I'm fascinated with this concept. 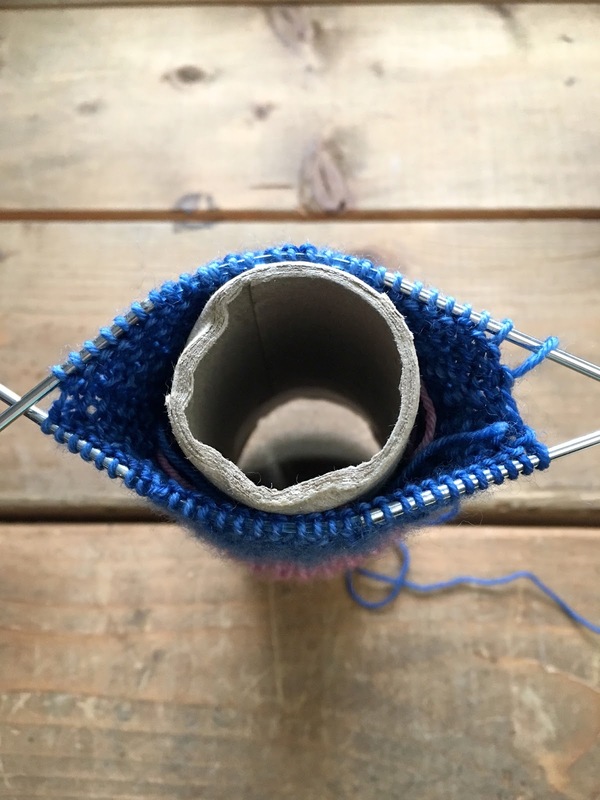 The flexible cord in the middle allows you to bend the needles. I'm still not completely comfortable with these. At one point I thought of switching to my trusty DPNs, but I resisted the urge. I'm going to persevere . . . I've convinced myself it's just a learning curve. Only time will tell. I've gone over to the dark side. Or maybe my fashionable daughters are finally rubbing off on me. I'm working on a hat for someone, and it needs a pompom so I started poking around online. 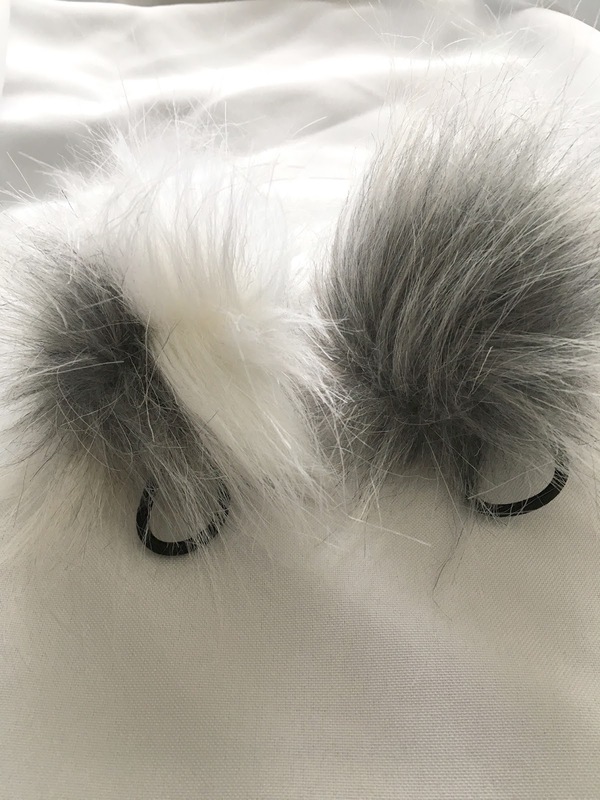 Little did I know there's a whole world of pompoms out there - real fur, faux fur, poms with snaps, poms with neon colors. So many options it was hard to make a decision. One of these will land on the hat under construction, but that's not all. Since I was ordering, I snagged a couple extra pompoms . . . just in case I want to make a hat for one of my daughters. It's kind of like buying buttons without a project in mind. 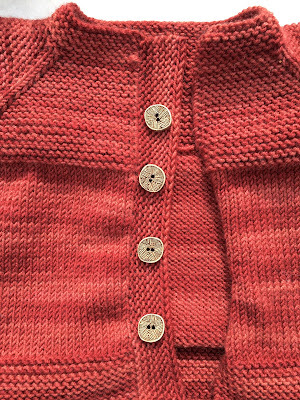 If I really love them, I work backward and build a project around the buttons. Well I fell in love with this one, and now I'll have to make a hat to go with it. A hat for me - not my daughter. But that's a project for another day. 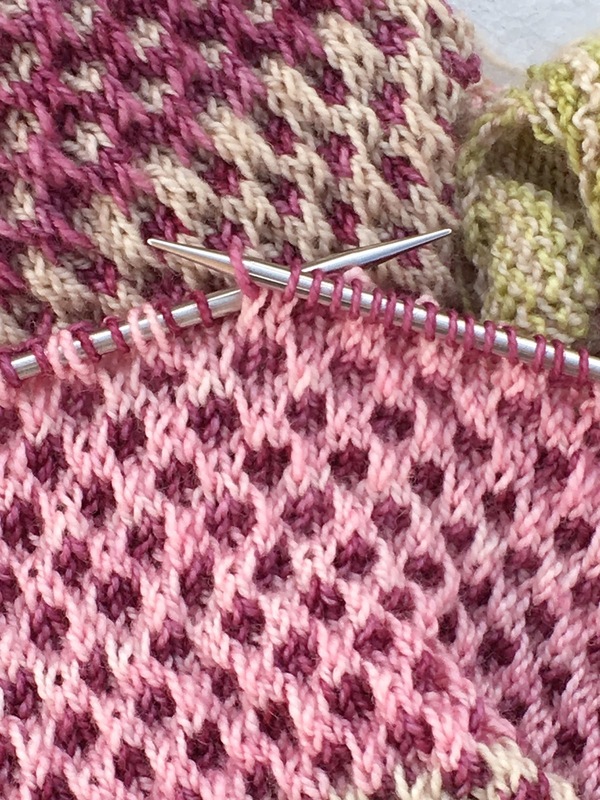 I'm still working on deadline knitting. 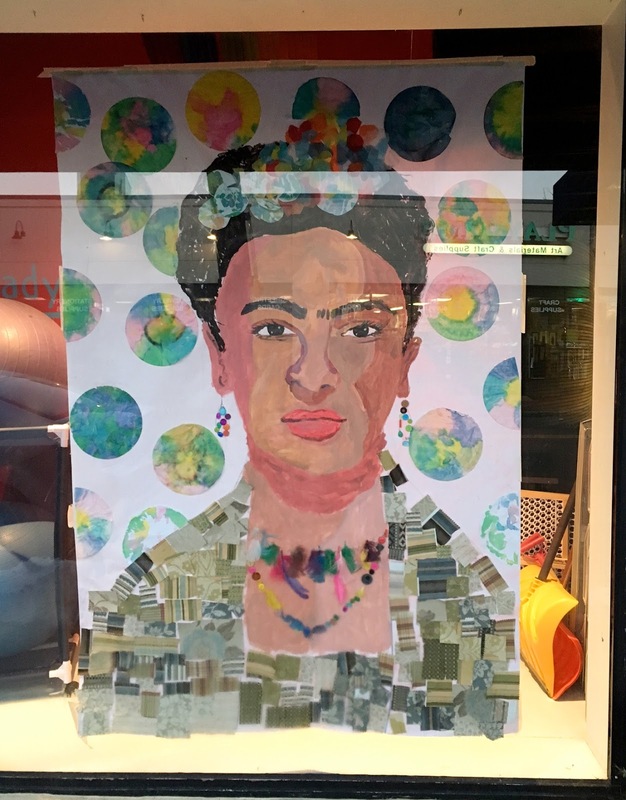 I spotted this week's color inspiration hanging in a window . . . a change from the usual bold, bright Frida Kahlo.